This post is a sponsored post brought to you by the Recipe Calendar meal planning app. All thoughts and opinions are my own. We are always looking for ways to optimize our life and health. Making daily changes, no matter how big or how small, they are a part of our journey and we should embrace its beauty. Eating healthy and planning all the meals can get overwhelming at times. 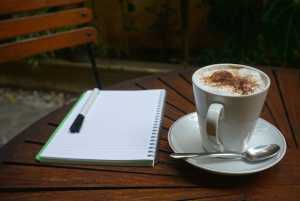 One of the advice that I give to all my clients is “If you want to succeed, always plan!”. If that means writing down on a piece of paper things to get done or what you want to improve in your life and how to work towards your goals, just do it! Planning your meals comes with many benefits. You start eating healthier, make better food choices, help you save tons of money and keep you accountable of the nutrients you are giving to your body. 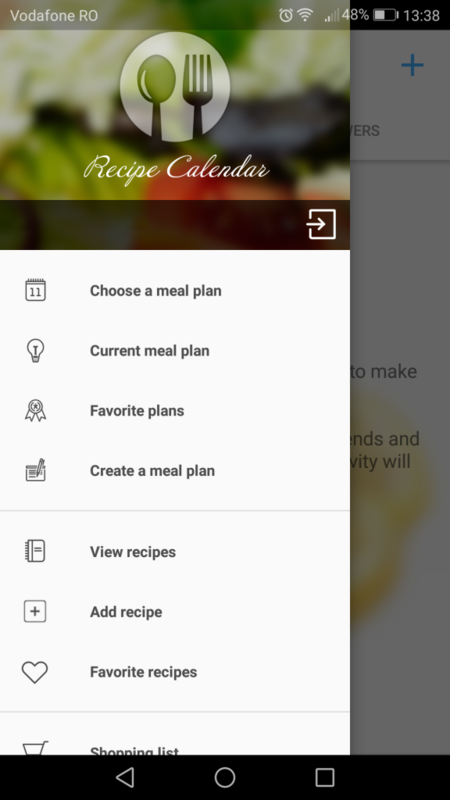 This meal planning app “Recipe Calendar” is all-in-one, it organizes recipes, builds shopping lists for you based on your current meal plan, gives you easy and fast yet delicious recipes to try and the most important thing meal plans. If you are that type of person who doesn’t like being told what to do, “Recipe Calendar” app lets you build your weekly menu from scratch which is awesome. But amazing is the fact that you have an option that instantly generates the shopping list for the meal plan, you’ve just created. Having a list of foods to purchase and a full stomach when you are going to the store, won’t let you buy all sorts of junk food and spend enormous amounts of money on foods that you don’t need. The first thing you have to do is to install “Recipe Calendar App” by clicking here. Then open the app and log in. I love that the app is fast and you can use Facebook to create a new account. The app is free, but if you want to enjoy all the benefits, there is a Pro Version (you can win some free codes – read until the end) which comes with many features that will improve your life, save you time, energy and money. The app is available for the Android users, in Play Store. 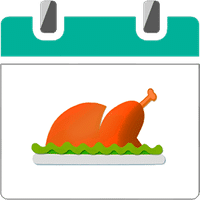 The Pro Version of Recipe Calendar gives you nutritional information on all the recipes; you get full access to all the meal plans and a cooking timer that will notify you when the meal is ready to be served and enjoyed by you and your family. And for only $5 a month, you should give it a try. 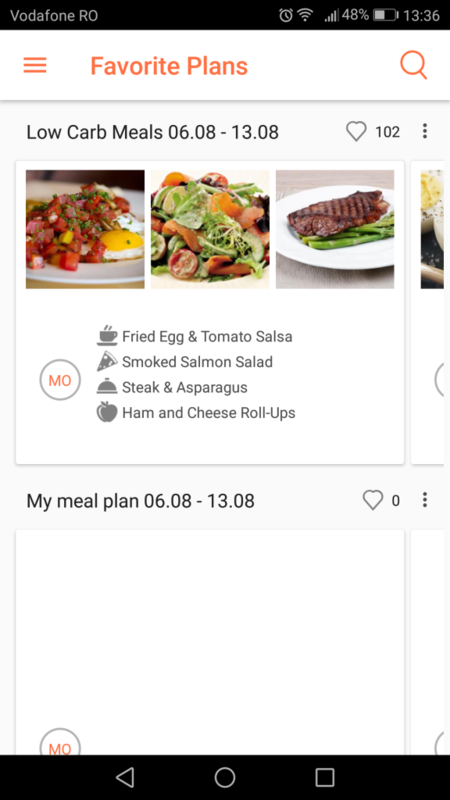 On the left side, you have a menu from where you can choose from the predefined, already available meal plans or you can opt to create your meal plan. You can choose from Weight Loss Menus, Paleo Inspired Diet plan, Low Carb meal plan even Vegetarian and Gluten-free Meal Plans and much more. Just go and take a look at all the menus available and hope you will be as thrilled as I am. A Low Carb meal plan it’s ready for you, and the only thing you have to do is to install the app, from Play Store. 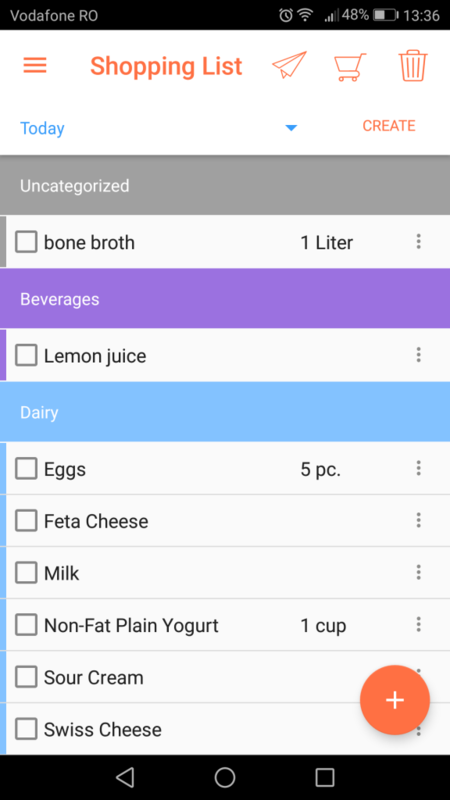 Once you have selected the meal plan you want to follow, you can generate the shopping list for all the products you need for each recipe. This is by far, my favorite feature. If you have more things to buy, you can add them manually. For example, I drink a cup bone broth every other day for its health benefits, so I added it to the list! The recipe section has plenty of mouth watering ideas for meals that you can add to favorites, like and comment on. If you aren’t such passionate about cooking, using this app may help you find recipes that super tasty and you will develop fantastic chef skills. The recipes will fit any lifestyle, and most of them are budget friendly. Even if you are all into fitness and weight loss you will find appropriate recipes. Also, you can set-up the app to send you notifications when it’s time to eat your meals or snacks. To create a beautiful community this app lets you add your own recipes and invite friends to join and work together, creating meal plans that can be shared with all the people using the app. If you are not still convinced that “Recipe Calendar” app is useful, I made a short video to show a clearer image of how the things work. Don’t forget to download your app here. The creators of “Recipe Calends” are kind enough to make a giveaway for you and let you win some amazing gifts. We have five fabulous prizes for you, guys. 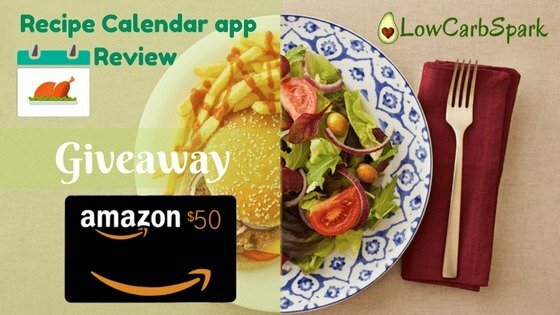 *1st place: $50 Amazon Gift card and a promo code for the PRO-Version of the “Recipe Calendar” app. And the rest of 4 prizes will consist of free codes for the “Recipe Calendar” app. All you have to do is to follow the rules below and earn as many points you can. 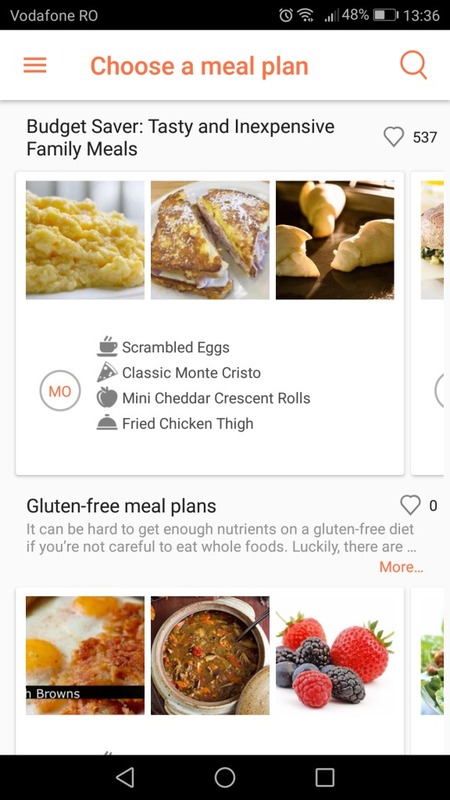 With a 4.6 rating and over 2300 reviews on Google Play, I really enjoy using the “Recipe Calendar” app because it is user-friendly and helps me stay connected to my goals, finding new exciting recipes to try and new persons to interact with. I know it is easier to eat healthy at home, and you typically eat less than you would eat out at a restaurant or fast-food, having a meal plan ready to follow in no time will help you stay on track. If you think it gets annoying and you have to eat the same meal over and over, the “Recipe Calendar” app gives you the opportunity to get inspired and cook recipes from cuisines all over the world, all packaged in a beautiful looking mobile app.